Head underground to the Mini VAULT Festival – an explosion of family friendly activities​ in the secret tunnels under Waterloo. Experience magical adventures with fantastic shows and free festivities. As well as theatre, circus and comedy, they’ll be storytelling, facepainting, games, live music, mini shows and more! The magnificent ​maze ​of caves and caverns​ underground Waterloo station​ will be taken over by interactive installations, ​dancing lights and ​craft activities, plus Balloon Bonanza, The Emperor’s Tombola and Magic Maverick! Download a full programme here. When: Saturday 7th, 10am – 3pm with Sunday 8th March hosting a special event 10am – 2pm Big Fish Little Fish present Magic Under London, a family rave! Ticketed. LittleBird’s Top Tip: After being underground for a few hours, some fresh air will be needed so head over to the Jubilee Gardens; a lovely green space in front of the spectacular London Eye with a great playground. Enjoy this retelling of this classic fairy tale in this unique setting on the Puppet Barge. Residing in Little Venice throughout the Winter and Spring months the Puppet Barge is rich in atmosphere and provides the ideal setting for the magical and imaginative shows produced throughout the year. Prize winning writer Deborah Jones gives this popular story a new twist. Presented with marionettes and shadow puppets, original music, lighting and effects, this is an enchanting show for all the family. LittleBird’s Top Tip: Little Venice is a beautiful spot where the Grand Union and Regent’s Canals meet, and offers an array of waterside cafes, pubs and eateries. You can take a boat trip along the canal or simply take a stroll along the bankside and enjoy the winding waterways – magical! 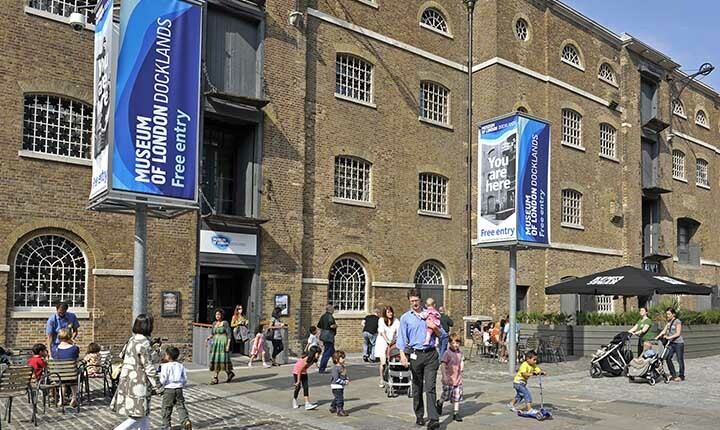 Celebrate International Women’s Day at the Museum of London Docklands this Saturday. There’s arts and crafts galore as well as plenty of storytelling; The kids will get to meet striking match girls, hear tales about women pirates and stories about famous women adventurers plus they get the chance to get crafty and make art inspired by the amazing women in their life. With lots to do at the Museum of London Docklands, there’s plenty to choose from when you’re not being inspired by Women’s Day. Enjoy the interactive Mudlarks, the sounds and smells of the notorious backwater know as Sailortown and Warehouse of the World where you can smell exotic spices and play games to find out where in the world imports to London’s docks came from. LittleBird Top Tip: Canary Wharf now has one of the UK’s largest collections of Public Art: download the latest art map and create your own art trail of discovery. Make a day of it? You might end up having tea here and if you do, there is plenty of choice including firm family favourites Nando’s, Wagamamas and of course Pizza Express! Announcing the arrival of spring and the passing of winter, Holi is a welcome burst of fluorescence following London’s bleak and blustery winter, where families traditionally gather together and cover each other in coloured paint. Popping up outside the Cinnamon Kitchen & Anise, this purpose-built party pod is a place where you and the kids can celebrate and enjoy ‘Little Holi’ sessions this Saturday. There are offerings of cocktails, canapes for the grown ups and of course three course meals for a price, but if all you fancy is thirty minutes of paint-pelting with family and friends in a colourful powdered wonderland, then that’s just fine. Experience the Cutty Sark this weekend as it hosts Musical Statues – fun for all the family this coming Saturday and Sunday. Let the kids help bring the colourful characters in the Cutty Sark’s figurehead collection to life. They then get the chance to make a fabulous head-dress to wear in a game of musical statues underneath the ship. LittleBird’s Top Tip: Visiting this Saturday? Meet James Robson, the Cutty Sark’s Cook. Join James Robson at 11.00am, 12.00pm, 1.30pm and 2.30pm and sing songs, learn sailor skills and find out what was for dinner on-board. Make a day of it? If you visit on a Sunday the Maritime Museum holds Discover Sundays – the Maritime Museum is free to enter and the activities are free too! Is the sea important to you? Go along and let the kids discover their surprising connections to the sea. Food glorious food! We love it, obsess about it even so why not find out about how the food you eat affects your body, brain and eating-habits. Visit the Science Museum’s new exhibition Cravings and explore how food affects your body, brain and eating habits. Search for answers to questions such as Is it the colour of your spoon, the food your mum ate while pregnant, the trillions of bacteria that dine with you, or the little known ‘second brain’ in your gut? With lots to do, see and touch including see an artificial gut whirring away, take part in a real experiment on flavour perception, touch some 3D-printed mice, sniff a scientific smell kit, and ‘chew’ some ‘bread’ in our interactive displays. Find out if scientists think we ‘eat with our eyes’ and if we can be ‘addicted’ to food. Whether you visit the exhibition or not – you can still take part in this Cravings experiment and help Heston Blumenthal find out more about how our senses can affect how we enjoy our food – snail porridge anyone? LittleBird’s Top Tip: If you know and love the Mighty Boosh and have a soft spot for Noel Fielding this might be one for you more than the kids but it’ll be worth the detour. Pop along to the Royal Albert Hall this Saturday as there is free access between 10am and 1pm and see He Wore Dreams Around Unkind Faces: An exhibition by Noel Fielding – you’ll find the exhibition on the ground floor, enter through door 12. Enjoy the British Museum’s digital workshop this Sunday and let the kids become journalists for the day and follow clues around the galleries using mobile phones. They then have the opportunity to create their own news report to share on the web – how cool is that! NB: The sessions last 120 mins. LittleBird’s Top Tip: Did you know you can borrow crayons, pencils and pads from the Families Desk in the Great Court? All you need to do is ask. Enjoy Art as you have never enjoyed it before. Take part in Lemon Artlab’s exciting treasure hunt as a family and discover new ways to see artworks while learning about art history, art critique, art concepts, artwork description and more. Learn more about the craziest artist in the museums following the clues and completing all the games at the Surrealism & Beyond room. This treasure hunt is the second part of Lemon Artlab’s workshop about surrealism and so families are welcome to just enjoy the treasure hunt and discover the amazing imagination of the surrealist artists while playing around the galleries. Make a day of it? Well that always involves food! so head to the cafe or restaurant on level 6 and kids under 12 can eat for free at lunchtime when an accompanying adult buys a main course from the menu. Valid for one child eating with an accompanying adult. Enjoy your Sunday at Hackney City Farm and book in a Pottery class for the afternoon for the kids. The sessions are run on a drop in basis and there is no need to book. Resident potters will help the kids design and make their own clay objects and the price includes firing in the kiln. There are two pottery wheels so note that your child won’t be able to spend the whole class using a wheel. It takes up to 3 weeks to get your piece fired for collection (with Mother’s Day being on 15th March this still leaves plenty of time) so talk to the session leader for more exact information about when you are able to pick up your pieces. Hackney City Farm has a range of farmyard animals including goats, sheep, chickens and donkeys as well as some small animals such as rabbits and guinea pigs. Head for the Queen Elizabeth Olympic Park this Sunday and join in a range of fun free sports and dance sessions exclusively for women and girls to celebrate International Womens Day! Experts will be on hand to guide you as you choose from a mix of rowing, boxing, fit media, table tennis, volleyball and dancing! You don’t need to be super fit or have tried any of the sports before – these sessions are the perfect way to sample some sports whilst having lots of fun. LittleBird’s Top Tip: Let the kids enjoy the Tumbling Bay Playground featuring rock pools, sand pits, tall treehouses, and wobbly bridges, as well as slides, swings and plenty of space to run about before you venture into the park using one of the many trails. Hyde Park is a great place to spend the day and this Sunday, weather permitting, why not book the kids into Skate Fresh Kids Club! These fun filled group classes are suitable any ability level. Using games and rolling activities the kids will be guided through the basic skills of inline skating, ensuring lots of fun and plenty of movement. Skate safety, stopping methods and turning skills are also taught. Knee and wrist pads and a helmet are all provided and the classes run fortnightly. LittleBird’s Top Tip: If you fancy skating with the kids and you’ve got all the kit, you can skate en famille, on mass every Sunday at 2pm in Hyde Park with LFNS.